Periodontal or gum disease is an infection of the gums that attacks the soft tissue around the gums. 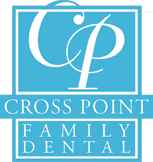 Crosspoint Family Dental offers gum disease screening and treatment in our Chelmsford, MA area office. Plaque is the most common element causing gum disease. Usually, problems are often discovered after they have persisted for an extended period of time. Proper oral hygiene and regular dental checkups help minimize the risk of gum disease. You don’t have to lose teeth to periodontal disease and by practicing good oral hygiene, you can significantly reduce your changes of ever getting gum disease. Infections in the mouth can wreak havoc elsewhere in your body. Evidence suggests that people with periodontal disease are at a higher risk for developing heart disease, stroke, uncontrolled diabetes, preterm births and respiratory disease. Remember to brush regularly, clean between your teeth, eat a balanced diet and schedule regular dental visits at Crosspoint Family Dental to keep your smile healthy. We offer appointments Monday-Friday and Saturdays by arrangement only. Offering gum disease prevention and help, we are conveniently located at 850 Chelmsford St. in Lowell, MA. Our office can be reached at (978) 459-6467.